"Making and eating Hello Dollies have been a tradition in our family for a long time. Every Christmas we always have to make these." Mix graham cracker crumbs and melted butter together in a bowl until evenly moistened; press into the bottom of a 9x13-inch baking dish. Pour 1/2 the can sweetened condensed milk over the graham cracker crust. 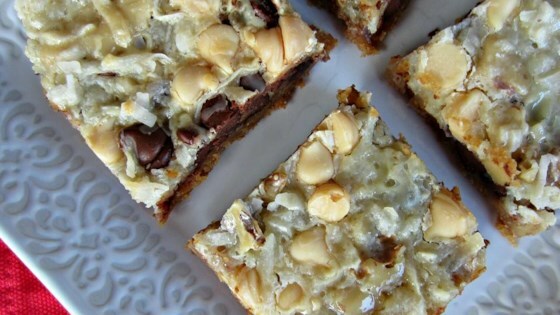 Sprinkle semisweet chocolate chips, walnuts, coconut, and white chocolate chips over the graham cracker crust; gently press chocolate, nuts, and coconuts into the crust. Drizzle remaining 1/2 can of condensed milk over the top. Bake in the preheated oven until fragrant and coconut is golden, 25 to 30 minutes. Cool completely before cutting into squares. No...I certainly will make it again! no changes.. they were loved by all!